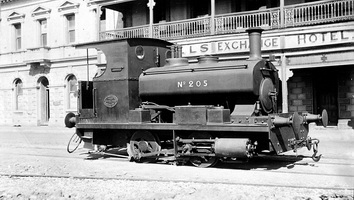 This locomotive was constructed for the South Australian Government and although never owned by theSouth Australian Railways, appears to have been allocated the number 205 within the South Australian Railways. numbering system. No other engine on the South Australian Railways carried that number. Th-e locomotive was controlled by the South Australian Harbours Board throughout its working life and used mostly for shunting at Port Adelaide and Glanville.